Florist Wilmington NC | Bloomers Flowers Blog - Wilmington NC | BloomersBlog: Paris Florists: Ooo-la-la! There is nothing like a Paris florist. 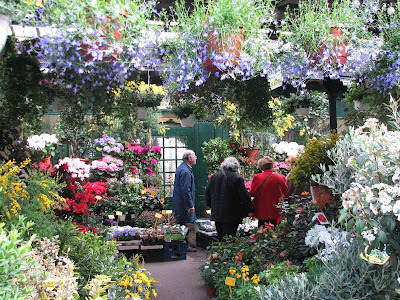 Words are inadequate to describe the feeling that a Paris flower shop evokes. What is it about flowers shops there, as opposed to, well, anywhere else? Here are my thoughts on it: First, Parisians take their flowers seriously. Look closely at this photo on the right and you will notice that the flower shop is right next door to the tobacco /lottery ticket shop. 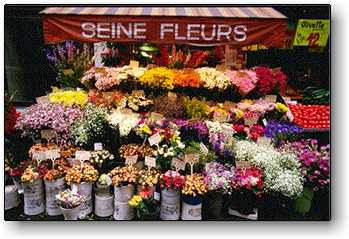 The French consider flowers to be among the everyday necessities things in life. Parisian flower shops subscribe to the "more is better" theory. No sad displays of tired bouquets. Rather, masses of fresh flowers, masses of potted plants, masses of everything, all at your fingertips and enticing you from the street! 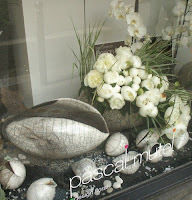 Parisian flower shops employ beautiful window displays to lure you in. And as in this photo, even a monochromatic display will beckon you. 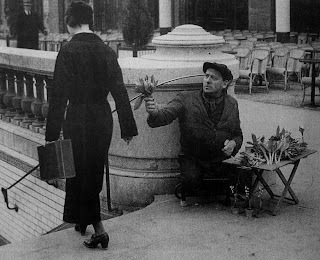 This famous 1928 photo by Andre Kertesz shows an amputee selling small bouquets of lily of the valley to passerby in Paris. It is at once sad and hopeful, and a moving example of how important flowers are to everyday life. One of the oldest florists in Paris is Au Nom de la Rose, where you will find absolutely everything to do with roses. Scents, foods, items for your home, beautiful gifts, and of course, fabulous roses to take home. If you favor elegance, you would enjoy the offerings at Herve Gambs. Their designs are impeccable and deceiving in their simplicity. 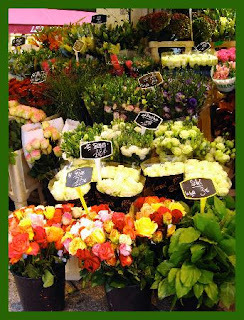 Along with the great florists, there are the wonderful Marché aux Fleurs (Flower Markets), the most famous being: Place Louis Lépine, Place de la Madeleine, and the oldest, Ile de la Cité which dates to 1808. They are wonderful places to stroll, sniff, examine, and discover. While I appreciate simplicity, for me, more is more! I love masses of flowers, especially a huge bouquet of all one flower. On every trip to Paris (or anywhere else, for that matter), flowers are one of the first purchases I make. I have to say that I really enjoy your blogs... not only are they interesting and educational but they always open my eyes to the beauty and wonder of flowers... I walk away with a deeper appreciation of just how much they enhance our lives in such unique and awe-inspiring ways. Thanks! great photos! Love the masses of color - so optimistic! Well, those Parisian flower shop were so cool! 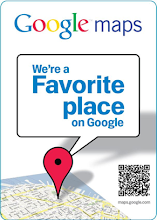 I think I will gonna enjoyed visiting there and wish I can go there to personally see those beautiful flowers. I'm looking for interesting topics as this. Looking forward for your next post. I Found Flowers on Etsy.com!